Spectrachem® has been in business since 1967. Our executive offices and manufacturing facility are located in New Jersey. We ship all across the United States and export to many countries around the world. The company’s motto is: “Superiority Through Aggressive Research”. Our R&D, strict Quality Control and high level of Customer Service give Spectrachem a definite edge over our competitors. 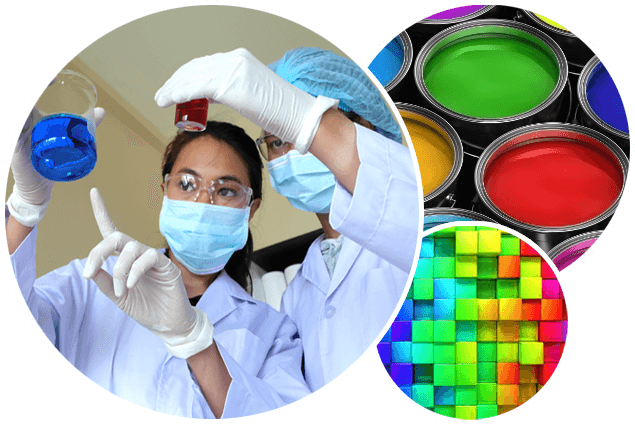 Spectrachem manufactures specialty adhesives, water based pigment dispersions, aqueous and plastisol printing inks. We compound resins, pigments, auxiliaries and additives to produce Spectrachem’s proprietary products that provide superior properties and are highly regarded in the industry. Plastique is a high solid, aqueous, Ready For Use (RFU) printing system that can be screen or roller printed. With adequate application, it will impact a gloss effect similar to a “Duco” look, Plastique is also used where ultimate fastness properties are required, such as in upholstery applications. Dyfast Low Crock is the premier soft hand binder for the textile market. These unique products are available from Spectrachem today! Call us for a fee quote. Spectrachem® and Spectrasperse® are registered trademarks of A.K. Technologies, Inc.
Google Analytics uses IP addresses to derive the geolocation of a visitor, and to protect the service and provide security to our customers. Customers may apply IP masking so that Google Analytics uses only a portion of an IP address collected, rather than the entire address. In addition, customers can override IPs at will using our IP Override feature.